This card is A5 size. To make the card I used white A4 card stock, Spellbinder Nestabilities labels 17. An embroidery design of small butterflies, Mauve Ribbon and Heat stick jewels. I created the designs to be printed on the card in Photoshop. Using items I had found on the Internet or created myself. I followed the instructions for Flip card given by Christina, and had a couple of trial runs to get the placement of the leaves right. Use normal paper for these runs. I mounted all the items with foam pads. This card is for my Goddaughter. Oh! 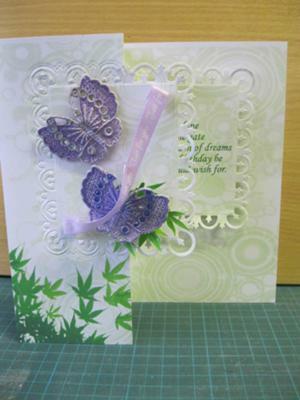 WOW I really like this card it is just beautiful and the butterflies look almost real. The colour is lovely and what can I say about Spellbinders that I haven't said a million times before. They are just such a treasured purchase and I would never like to be without mine. There you will find all techniques to help you create soem beautiful cards. Your card is absolutely beautiful. Your butterflies are gorgeous, I'm a BIG fan of butterflies. These butterflies are machine embroidery which I did nyself. Most of my cards have some embroiery on them. Your card is so pretty. Who makes your butterfly punch?